SAN JOSE, Calif., March 28, 2019 /Christian Newswire/ -- Christians and churches are sharing Christianity without fear or censorship on a new social network called USA.Life. "Pro-Christian USA.Life is one of the greatest works of God being done today, because it opens doors for Christianity," said Steven Andrew. He is the Silicon Valley technology leader and pastor in charge of the website. Andrew has a vision from God "to save the USA by uniting the country on the Christian beliefs of our founding fathers." That is why this social network has a patriotic name. Yet, USA.Life is not a Christian only site, as it is a true alternative to Facebook and Twitter. USA.Life is for all who love America. "Christians and conservatives are signing up fast from all over the world," he said. Andrew was one of the first Christians that Facebook shadowbanned, starting in 2016. "On my account alone, Facebook data reveals they block 5 million people per month from my reach. The massive censoring happening shows there is a huge need for Christians and ministries to switch to USA.Life to avoid being blocked," Andrew said. "People are excited with the launch of USA.Life this month," he said. Users share great interest in the new website. "I am emailing and telling everyone I know about this new platform. May you be blessed and this whole endeavor flourish in Jesus name!" said Olivia Reid. "I can't believe that finally we won't be censored anymore!" said Adam Van Hulten. "I have been praying... Answered prayer," said Christy Stock. "Thank you USA.Life for providing a platform that allows Christian and Conservatives without censorship. It is a fantastic site," said Donna Bowman. Andrew said, "If you want to go from censorship to freedom by freely sharing Christianity, then USA.Life is for you." "To strengthen the church, it is important for individuals and churches to sign up today at USA.Life" Andrew said. "Our goal is to build the community to millions of people as soon as possible to save America." 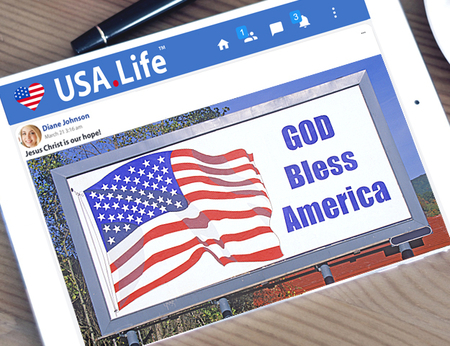 "USA.Life social network is the answer to Facebook and Twitter censoring Christians, conservatives and liberty," says CEO Steven Andrew. With USA.Life users share life, liberty and happiness, and connect with those important to them. This is where friends, families, churches and businesses share photos, videos, news and messages, and join public and private groups. All user information is private. Get a free account at www.USA.Life.